Moon Orbit Wrong Cornell University associate Lorenzo Lorio, Has Researched i’m sure because of public outcry & observations made by You, my Friends, Visitors & others on the Internet and Concluded that Indeed there Is Something Wrong With The Sun Moon & Earth. Frankly I don’t care at this point what is causing it, the fact is something is not right with the moon. Thats all I need to know at this point. OK, this will mostly be a “follow the links” and “toss stuff at the walls” posting. I’ve had a 10 hour day at work, it’s a bit late, I need to get up and do it all again in about 7.5 hours, so every hour here is one less hour of sleep. That means things will be a bit terse without a lot of “connect the dots” prose. Pretty much lays it all out, IMHO. (Graphs from it are in the various articles). That paper ASSUMES certain periods and orbital cycles for the moon, in order to make the math more tractable. It basically sets the orbital parameters to what they are now, and changes at only what is known and assumed cyclical. Essentially, a lunar model orbit. From that it calculates tide forces and what they would do. All of this, more or less, based on the notion that the orbit of the Moon is known, and fairly constant. Well, it isn’t, really. It’s not totally wonky, just not as stable as everyone assumes and prone to ‘wander’ some. Wandering in ways that can increase tides. Perhaps quite a lot. Perhaps enough to cause major shifts of weather and climate. That’s what this posting is about. Those missing bits. What started me down this particular path was a posting at WUWT. It looked to me like a follow on to some discussions of ice age glaciations over at Tallbloke’s Talk Shop about what causes glacials to end. I’d commented on one or two of the threads, but can’t find just which one now. At any rate, here’s a couple that are of interest. This all ends up in a posting at WUWT, which gets me looking into lunar orbital mechanics a bit more. So that’s the “set up”. A key point to keep in mind is that the natural state of the planet is frozen into a glacial period. We are presently in an Ice Age. They last for millions of years. What folks often call an Ice Age is really just one big glacial episode in that bigger Ice Age. Each glaciation runs about 100,000 years. Yet inside those glaciations can be interstadials where things get nearly as warm as now for a few hundred to a couple of thousand years, or interglacials where the warmth lasts a few thousand to 10,000 years. So what hooks all this together? Surely not just a simple repeating pattern of predictable lunar orbits? That’s close, but there just doesn’t seem to be quite enough power to make a full on glacial just go away. But, what if the lunar forces changed not just in time, but in size and scale as well? What if that were happening now? We see that spring lunar tides for a lunar orbit twice the current eccentricity would be about 60% higher than they are today. 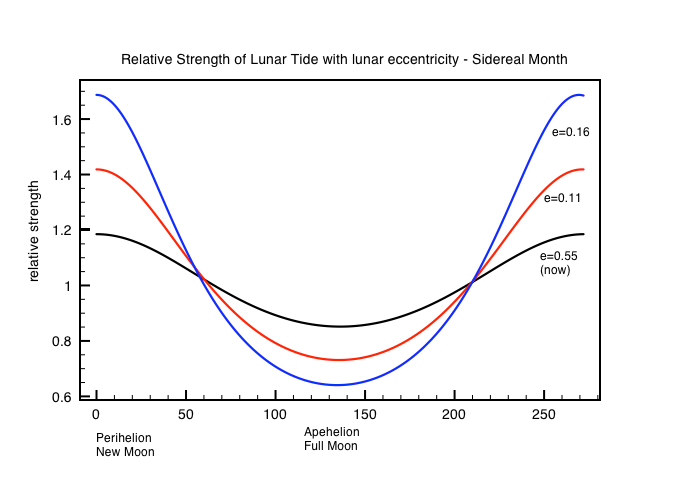 Lunar tides are about twice the strength of solar tides so overall spring tides would have been at least 50% stronger than they are today, and Super Perigean tides would have been 20% stronger again. Are these super-tides the catalyst to break up the large northern ice sheets and exit ice ages once every 100,000 years ? But what if tides might be even larger? He, too, assumes that the orbit is regular and predictable and about like it is now. Then puts in some of the expected eccentricity changes. But is that the only thing going on? It also has some very nice graphs. I’ll only put one or two here for illustration of what’s going on. They show that the length of month wanders around rather a lot (lunar month) and that the tide forces ought to wander a lot with that. 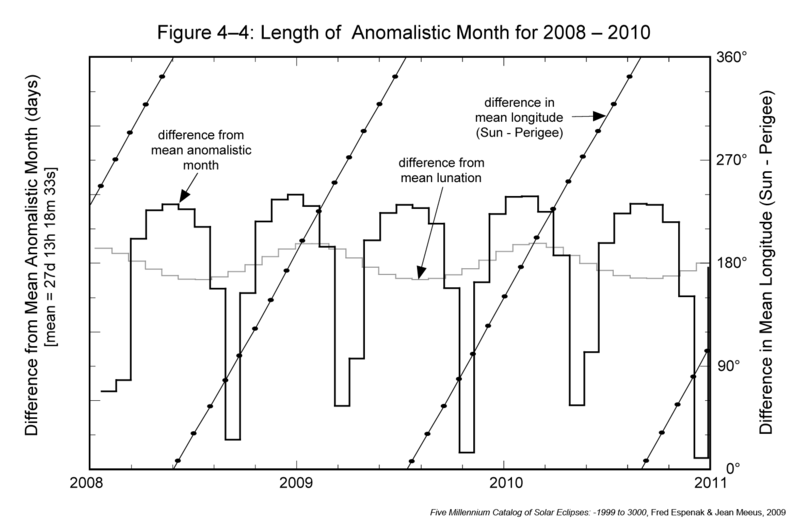 Length of Anomalistic Month variation. The mutual gravitational force between the Sun and Moon is over twice as large as between the Moon and Earth. For this reason, the Sun plays a dominant role in perturbing the Moon’s motion. The ever changing distances and relative positions between the Sun, Moon, and Earth, the inclination of the Moon’s orbit, the oblateness of Earth, and (to a lesser extent) the gravitational attraction of the other planets all act to throw the Moon’s orbital parameters into a constant state of change. Although the Moon’s position and velocity can be described by the classic Keplerian orbital elements, such osculating elements are only valid for a single instant in time (Chapront-Touze’ and Chapront, 1991). Nevertheless, these instantaneous parameters are of value in understanding the Moon’s complex motions particularly with respect to the three major orbital cycles that govern eclipses. So the Sun stirs the Lunar Orbit and the Moon stirs the oceans. And it does this in a quasi periodic way that has some surprising excursions from time to time… I note in passing that changes to the “oblateness” of the earth is likely to cause some earthquake and volcano changes, IMHO. OK, so all these things can mix to cause some significant changes in where the cold water is on this planet, how much mixes into surface waters, and just how big the tides are. Anything else? 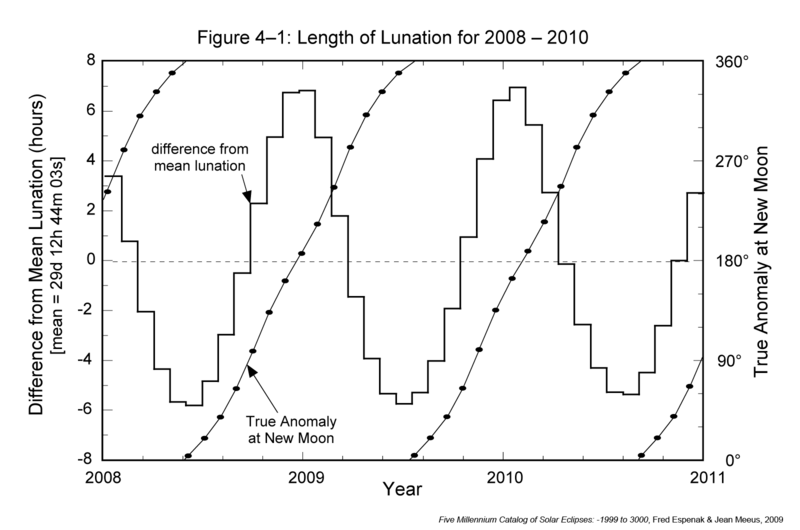 How about the lunar eccentricity is increasing and we don’t know why? A recent analysis of a Lunar Laser Ranging (LLR) data record spanning 38.7 yr revealed an anomalous increase of the eccentricity of the lunar orbit amounting to de/dt_meas = (9 +/- 3) 10^-12 yr^-1. The present-day models of the dissipative phenomena occurring in the interiors of both the Earth and the Moon are not able to explain it. We examine several dynamical effects, not modeled in the data analysis, in the framework of long-range modified models of gravity and of the standard Newtonian/Einsteinian paradigm. It turns out that none of them can accommodate de/dt_meas. Many of them do not even induce long-term changes in e; other models do, instead, yield such an effect, but the resulting magnitudes are in disagreement with de/dt_meas. In particular, the general relativistic gravitomagnetic acceleration of the Moon due to the Earth’s angular momentum has the right order of magnitude, but the resulting Lense-Thirring secular effect for the eccentricity vanishes. A potentially viable Newtonian candidate would be a trans-Plutonian massive object (Planet X/Nemesis/Tyche) since it, actually, would affect e with a non-vanishing long-term variation. On the other hand, the values for the physical and orbital parameters of such a hypothetical body required to obtain the right order of magnitude for de/dt are completely unrealistic. Moreover, they are in neat disagreement with both the most recent theoretical scenarios envisaging the existence of a distant, planetary-sized body and with the model-independent constraints on them dynamically inferred from planetary motions. Thus, the issue of finding a satisfactorily explanation for the anomalous behavior of the Moon’s eccentricity remains open. So “something is going on” that is increasing orbital eccentricity, but it is unexplained by all that we know. This link to a pdf does a good job of stepping through what was looked at, and what is still stuck. Oddly, Germany seems to get a lava flow just about the start of each Interglacial. Almost as though there was some tidal force working on the magma and crust. Turns out that in the past, tides were quite different from today. These two articles are mostly looking at things like the Hudson Bay acting as a tide damper for the North Atlantic, so during glacial times it can’t do that and tides are much higher. Aug. 2, 2011 — The ebb and flow of the ocean tides, generally thought to be one of the most predictable forces on Earth, are actually quite variable over long time periods, in ways that have not been adequately accounted for in most evaluations of prehistoric sea level changes. Some tides on the East Coast of the United States, for instance, may at times in the past have been enormously higher than they are today — a difference between low and high tide of 10-20 feet, instead of the current 3-6 foot range. And tides in the Bay of Fundy, which today are among the most extreme in the world and have a range up to 55 feet, didn’t amount to much at all about 5,000 years ago. But around that same time, tides on the southern U.S. Atlantic coast, from North Carolina to Florida, were about 75 percent higher. The findings were just published in the Journal of Geophysical Research. The work was done with computer simulations at a high resolution, and supported by the National Science Foundation and other agencies. One of the most interesting findings of the study, Hill said, was that around 9,000 years ago, as Earth was emerging from its most recent ice age, there was a huge amplification in tides of the western Atlantic Ocean. The tidal ranges were up to three times more extreme than those that exist today, and water would have surged up and down on the East Coast. One of the major variables in ancient tides, of course, was sea level changes that were caused by previous ice ages. When massive amounts of ice piled miles thick in the Northern Hemisphere 15,000 to 20,000 years ago, for instance, sea levels were more than 300 feet lower. But it’s not that simple, Hill said. OK, so is there any other reason to think tides might have been higher in the past? Perhaps even during recorded history? How about a Greek observer? Pliny reports that “Pytheas of Massalia informs us, that in Britain the tide rises 80 cubits.” The passage does not give enough information to determine which cubit Pliny meant; however, any cubit gives the same general result. If he was reading an early source, the cubit may have been the Cyrenaic cubit, an early Greek cubit, of 463.1 mm, in which case the distance was 37 metres (121 ft). This number far exceeds any modern known tides. The National Oceanography Centre, which records tides at tidal gauges placed in about 55 ports of the UK Tide Gauge Network on an ongoing basis, records the highest mean tidal change between 1987 and 2007 at Avonmouth in the Severn Estuary of 6.955 m (22.82 ft). The highest predicted spring tide between 2008 and 2026 at that location will be 14.64 m (48.0 ft) on 29 September 2015. Even allowing for geologic and climate change, Pytheas’ 80 cubits far exceeds any known tides around Britain. One well-circulated but unevidenced answer to the paradox is that Pytheas is referring to a storm surge. Matching fragments of Aëtius in pseudo-Plutarch and Stobaeus attribute the flood tides (πλήμμυραι plēmmurai) to the “filling of the moon” (πλήρωσις τῆς σελήνης plērōsis tēs sēlēnēs) and the ebb tides (ἀμπώτιδες ampōtides) to the “lessening” (μείωσις meiōsis). The words are too ambiguous to make an exact determination of Pytheas’ meaning, whether diurnal or spring and neap tides are meant, or whether full and new moons or the half-cycles in which they occur. Different translators take different views. OK, maybe the guy over estimated. Maybe he used a strange “cubit”. There are some who assert him a charlatan (but reason to think they are not all that accurate either…). But what if he did see rather large tides? Maybe not 3x as high as now, but just double? Or even 1.5x the tide. 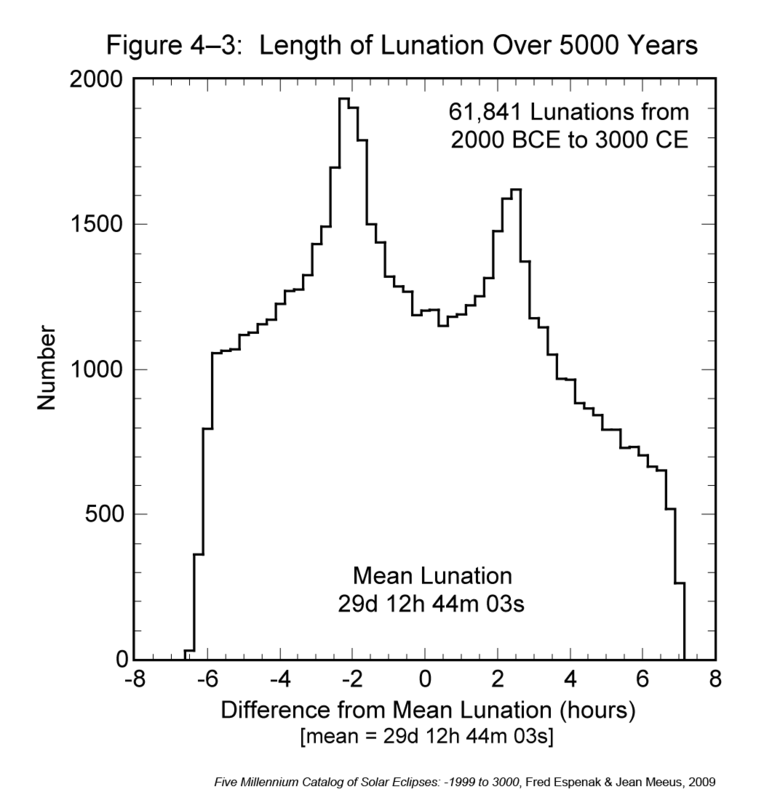 Do we really know what the lunar orbital elements were in 400 BC? We are not even sure why they are changing today. 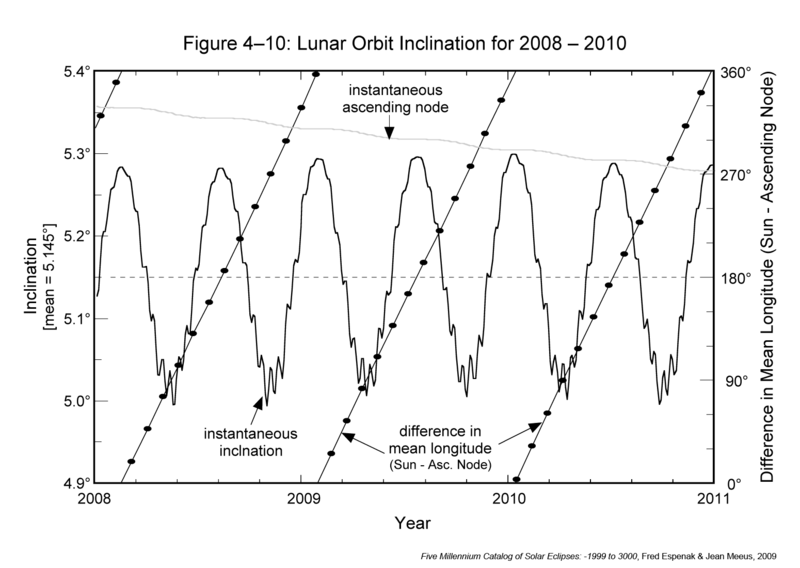 Just how eccentric can the lunar orbit get? How much elevation change? Do we really know? We are, in fact, a binary planet system. The moon is always in a “concave to the sun” orbit. It does not make curlicues in space and does not go retrograde relative to the sun. The moon and earth share a common orbit about the sun, slowly changing who is in the lead, and who has the inside or outside track. The sun stirs this pot, as do the gas giants (and who knows what else). In the end, all we can really say is that it has changed, is changing, and will change. The best guesses we have include saying that tides were much higher a few thousand years ago. So why not two thousand years ago? And why not 2000 years from now? If we can’t define the range of the tides, how can we define the range of ocean overturning force and cooling, or the range of tide induced cooling or warming that is normal? Yes, we can figure tide tables for a few years. With reduced accuracy even longer. But thousands? History and what we know of modeling tides says “things change”, and sometimes quite a lot. Is it enough to end glacials and break up ice sheets? To perhaps lead to warmer than normal times when tides slack off? 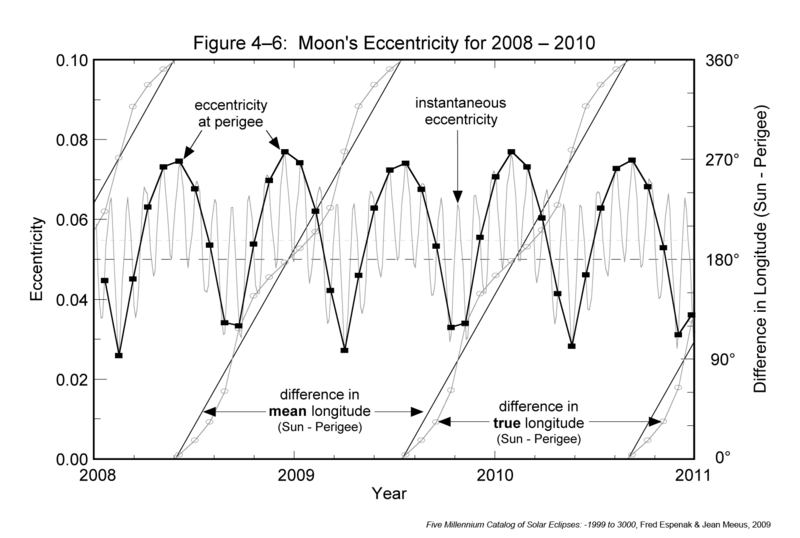 Will increasing lunar eccentricity cause more cooling? How much is driven by the sun? And how much by the other planets? With that, I close this posting. I get 6 hours sleep tonight. Hopefully more tomorrow night ;-) But this collection of lunar links and observations was nagging at me and would not let go until posted. I’ll just add one more minor point here: Stonehenge has many aspects that track and predict lunar motions and positions. Perhaps 4000 years ago there was even more reason to watch and track the moon. Perhaps we ought to do a bit more of that today. To me, it is pretty clear that there are a lot of things we don’t know. Many things about CO2 that are flat out wrong. And a great deal of historical change being ignored by Grant Seekers with the CO2 boogyman. For my money, it’s the moon that matters most, not a few parts per million of CO2 in a water laden sky. Certainly the moon matters more on a water world with oceans and giant tides. Post Script: I’m skipping my usual proof read / link QA in the interest of being awake at my desk tomorrow (today?). Please note any “issues” and I’ll fix them later. For now, sleep demands its due. This entry was posted in AGW Science and Background, Earth Sciences, Science Bits and tagged AGW, Glacial, history, Ice Age, Interstadial, Lunar, Tide. Bookmark the permalink. “So the Sun stirs the Lunar Orbit and the Moon stirs the oceans”. Not only that. The shift in jet stream patterns going further south (and North on the SH) in combination with blocking triggers a shift in wind patterns and wind strengths. Almost all this winter season Europe is in an airflow that originates from Central America, hence the relative warm Western European winter. This wind causes the big waves that hit the Portugal and British coast. What we see here is a massive destruction of heat and the prelude to much colder times. Thanks for this intriguing post. If the Moon was produced by fission of the proto-Earth, as I believe, then Earth probably also suffered a traumatic event. E. M. Smith, why don’t we introduce the next crypto currency and really get something done? I send you my contact info at your e-mail address. While some think the “science is settled”, it is work like this that raises the questions that are unanswered (and to some – refused to answer). These questions make the issue of how man evolved and is now dominant seem to be the more pressing ones. For what was done can be undone. And there is nothing we can do to stop it. Fascinating read. Thanks for the sacrifice of sleep for bringing it to us. Sun moon earth tides brain dump! Lol Sometimes you just have to unload before you can rest. Good job. Amusing to think that, some time in the future, the Apollo missions may be seen to have been worth the expense if only for the lunar ranging reflectors that were left on the surface. I have been trying to use the JPL ephemeris to calculate the moon’s orbital parameters 17,000 years ago. I beginning to conclude that the Milankovitch cycles really only apply to the earth-moon barycentre. The effective moon-earth orbit is far more complex as you have described. Therefore it seems likely that larger excursions in the gravitational coupling between the two must result as the overall eccentricity increases. How could we prove this hypothesis ? Well, for starters, the only reason a crypto currency gets acceptance is due to it being promoted, and I’m not a big promoter. Then there is the problem that anyone can launch a crypto currency, so it is inherently prone to “competition”. Oh, and the U.S. Feds have just started to play in the crypto currency playground, so it’s stepping into the bull pen just at the wrong time. Opposed to that is that anyone can issue a currency. ( Just an I.O.U., really) So crypto currencies are not all that different. All gain acceptance based on others using it. I don’t know. Somebody will make money off of it..
“Well, for starters, the only reason a crypto currency gets acceptance is due to it being promoted, and I’m not a big promoter. Then there is the problem that anyone can launch a crypto currency, so it is inherently prone to “competition”. Oh, and the U.S. Feds have just started to play in the crypto currency playground, so it’s stepping into the bull pen just at the wrong time. E. M, please contact me, I have send you my contact info. Chiefio, can you have a look at why Clive Best’s comments have got stuck in moderation please? I am not sure which of the 2 moon threads he posted on, so I commenting on both. The first time someone comments here it goes to moderation. How long it stays there depends on how hectic it is at work… Once approved, future comments are only “moderated” after the fact, or if they trigger some key word that WordPress is hung up on at the moment. I’ve approved both of his comments, so they are now visible. Also, future comments from Clive ought to show up immediately. One is upthread here, so the other is likely on the other thread. If the JPL ephemeris is the same as NASA (which I would expect) it gets off kilter in as little as a 1000 years per that Indian data / paper. I think you will need to make a new one that does match the recorded eclipses to have any hope of doing 17,000 years. Classic and Einstein gravity do not explain the tides, they are forecast only by precedent. Some thing else causes them? A great thought provoking read. Thank you. It occurred to me yesterday (sorry if I’m extremely late on this topic) that TPTB might not necessarily be trying to destroy this country, per se, but “merely” its currency. Is that why there is so much interest in new currencies? I read that the Chinese want to use their currency for oil trading. Will it instead end up being some kind of virtual currency? Re the moon: the crescent shapes seem to be less east-and-west oriented, and more north-and-south oriented. I read somewhere that a person had noticed the change and wondered about it. I thought they were talking about a photoshopped image. The next time I had a chance, I noticed that it indeed does have north-and-south (top-and-bottom) crescents rather than east-and-west crescents now. Is that the biggest clue that something is off about the orbits of the sun, moon, and earth? Sorry to be so dense and late to the party, but I’ve had lots of diversions lately. It’s like I’m mostly under water, but once in a while come up for air and have a burst of female intuition. Apparently Newton said that calculating the moon’s orbit was the only thing that gave him a headache! Yes, and they are using those reflectors to claim that the Moon is moving away from Earth at about 4 cm/yr. And, the “science” they use to explain this is almost as funny as climate “science”. Re moon the cause of seismic and volcanic activity. As the Earth-Moon barycentre is well below the Earth’s crust, the moon is surely the best candidate for the cause of continental drift?